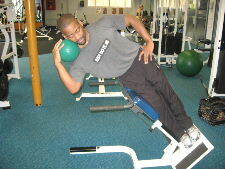 Below is a tough oblique and love handle exercise. But remember that working your love handles and obliques will not magically get rid of stomach fat. Also, this is a really challenging exercise, it puts lots of pressure on the oblique muscles and the lower back muscles. So listen to your body and build up slowly. 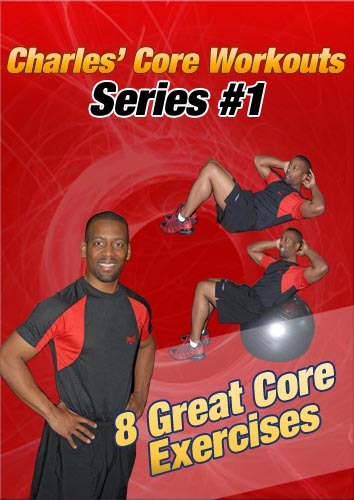 I would not recommend this exercise for beginners or people with serious lower back injuries. Below is are pictures and instructions for this exercise. Starting Position: Adjust the roman chair or hyperextension board so that your thigh rests comfortably on the pad. Secure your feet and hold a medicine ball against your bottom shoulder. You should feel a slight stretch in the obliques in the starting position. Form: Exhale and raise up your body until your trunk is parallel with your legs. At that point, rotate your bottom elbow and trunk up towards the ceiling and continue side bending until you get to the end of your range of motion. Hold for a brief second and then untwist as you lower to the starting position. Again, this exercise is very challenging on the oblique muscles and also the lower back. If you are a beginner, first master an easier version of side bends on the roman chair. If this exercise is too difficult, you can try it first without a medicine ball. You can use a 2 pound medicine ball to start and build up as your strength improves. 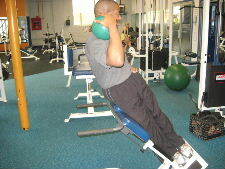 And obviously you can use dumbbells or any other form of resistance to make this exercise harder. This is just one oblique and love handle exercise for your oblique muscles. If you don't have access to a gym or this machine try another oblique and love handle exercise on this site.